JANISSARIES......LIVED BY THE SWORD,DIED BY THE SWORD. It was five years ago that I came across the word Janissary for the first time.It was while visiting a museum along with Geetha in Istanbul,Turkey. However it did not register in my mind then.Recently while I was re reading few chapters of 'Discovery Of India', I noticed the word once again.Nehru has specifically mentioned about Janissaries. While covering up fall of Constantinople he has done it without going into details. This made me not to skip the word again and to learn more about it. I am glad that I did. Janissaries were the shock troops of the Ottoman Army which terrified Europe for few centuries. 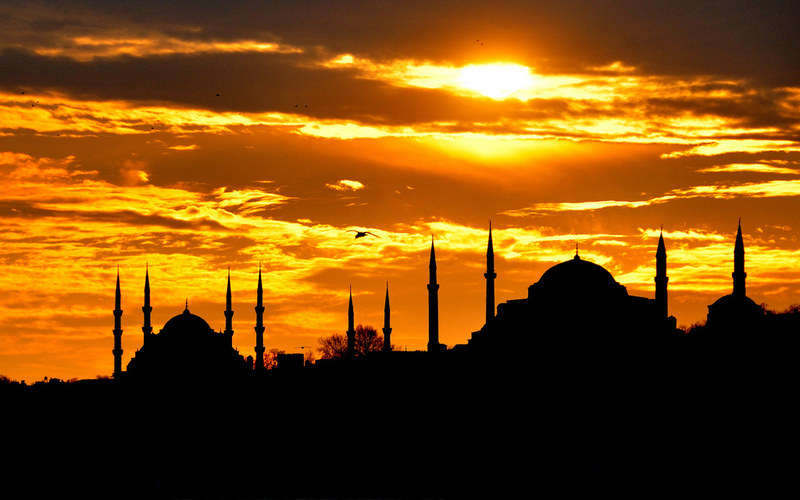 They did the job of taking Constantinople for the Sultan, which changed the course of world history thereafter. They were the best trained troops, well fed, well paid but celibates, need be loyal only to Sultans. Ironically initially they were forcibly taken from poor Christian families of nearby conquered Balkan countries at the time of their birth or infancy. They were converted to Islam and by years of rigorous and vigorous training they became the most dreaded troops of Ottomans feared by Christian armies of other countries! But 450 years later it ended not without a twist in its own history! 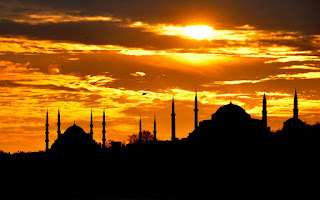 Roman and Christian past and Islamic present make the modern city of Istanbul as one sees now. I love this city for its beauty and historical past. Simply it is enchanting. Truly it bridges not only physically but also cultures and life styles of two continents- Asia and Europe! It was in 1380 that a new corps was originally created by Bey/Sultan Murad I. First few batches were formed from Christian prisoners of war and slaves who were ready to change their religion and declare complete loyalty to Sultan. In fact Janissary in Turkish means a new soldier. They were deployed successfully as personal body guards of the Sultan. Thereafter children from Balkan provinces-Greece,Bulgaria,Armenia,Albania... were recruited at their time of birth from poor Christian families. They were well fed and given years of special training in infantry, wrestling, archery, horse riding and all sorts of war fare. They were to remain as celibates but later this rule was changed. Obviously they were groomed as Muslims and Islamists with no connections to their own families. Loyalty only to Sultans. They were paid well along with a lot of fringe benefits. Very soon Corp of Janissaries became not only very powerful potential force within the Ottoman state but infallible army of the Sultan! 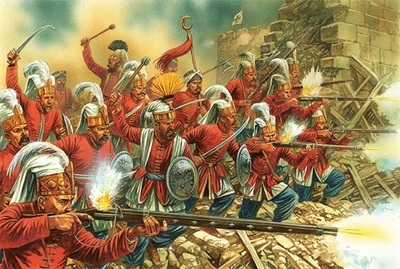 As elite forces of Sultan the corps made many successful conquests. Dreaded by Christians but respected by Muslims! Thereafter Sultan recruited from Muslim Youth of Turkey itself. Apart from being body guards of the Sultan, they were given responsibility of upkeep of hunting dogs and falcons, fire fighters, police officers, customs officials....They had to be clean shaven always without a beard.Parents in Ottoman Empire dreamed of a career in this corps for their children! Number of Janissary was just around 6000 in 1475 but by 1800 it went up to 140,000! Over time the Janissaries were so successful that they became most powerful institution within empire. They could even influence the policies of Sultan and saw that their own interests are protected at any costs. They demanded very high standards of living which was costlier to the exchequer. They did not cooperate or listen to other officials or power centers within the sultanate. By end of 17th century Janissaries could even stage few successful palace coups. They even killed a Sultan- Ibrahim I!! and now a museum...a lively scene today at Istanbul. Janissaries were no more in the good books of Sultan by end of 17th century. The fact that they had become a state within state , Sultan could not digest any more. He wanted to stop this corps but knew that if not handled well it can bring not only the empire to chaos but the death of Sultan himself. In 1826 Sultan Mahmud II decided to form a new European staffed Army. Janissary Corp could not agree to this and revolted against the Sultan. In turn Sultan declared war on them and attacked their accommodations in surprise with full force. He killed almost all of them- 135,000 in number instantly. Others were hanged in public!That ended Corp of Janissaries which lasted almost 450 years!! What Sultan created for him, he had to destroy for him! !Strange but true story in the history. In Bulgaria the word Janissay is used as a synonym of the word traitor even today.Janissary appears in many of the new gen video games I understand.